Recommended Uses: Business Address & Small Message Stamping. Recommended Uses: Email Address, Website Address or Company Name Stamping. 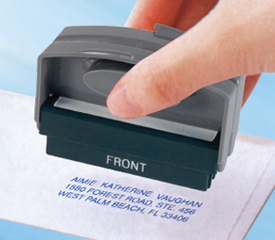 Recommended Uses: Bank Endorsement, Address or Small Message Stamping. Recommended Uses: Return address, Message Stamping. Recommended Uses: Bank Endorsement and Large Address Stamping. Recommended Uses: Company Name, Long Phrase or Long Signature Stamping. Recommended Uses: Inspection or Initial Stamping.